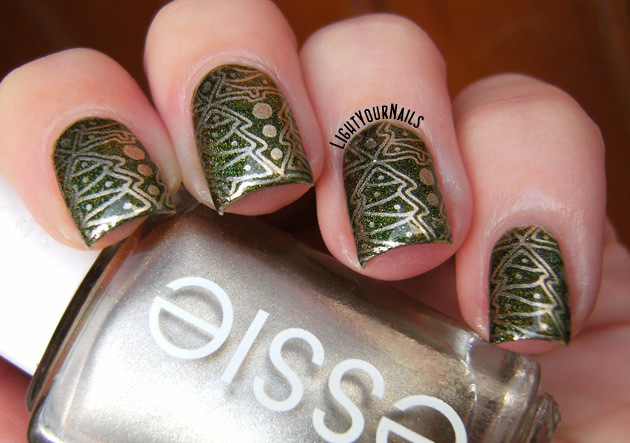 Christmas trees - 12 Days of nail art | Light Your Nails! Not that I can join every single day in the 12 days of nail art challenge, but chance was I did this mani last week that fits today's theme so here I am again! We are showing you Christmas trees! I went for a classic green base using the awesome Smitten Polish Between the Baubles and stamped over it with Essie Good as Gold and plate MC-02. If you pay attention to this pattern you'll notice that there are two different upside down trees. Non riuscirò certo a fare ogni puntata della 12 days of nail art challenge, ma la scorsa settimana avevo fatto una manicure che si adatta perfettamente al tema di oggi, quindi ne approfitto! Oggi parliamo di alberi di Natale. Sono partita con lo smalto Smitten Polish Between the Baubles per una classica base verde, e ci ho stampato sopra con Essie Good as Gold e la plate MC-02. Se guardate bene il disegno sono due diversi alberi sottosopra alternati. This mani is probably nothing super fantastic but I quite liked it and I wore it for two good days. E' una nail art semplicissima, niente di eclatante nè di troppo invasivo ma a me è piaciuto molto indossarla. 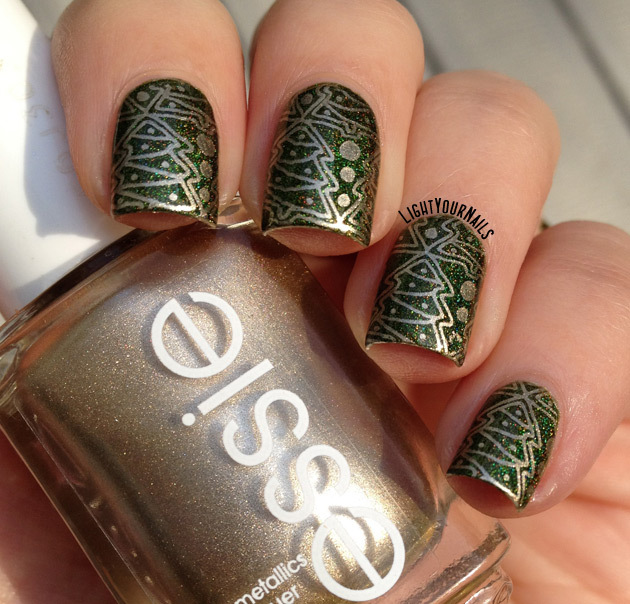 The green with the antique-looking gold looks so perfect together! It's elegant, I like it a lot :) Great pattern. Thank you so much Izabela! Questo me l'ero perso su Bloglovin...che bello! *_* da replicare! this is lovely. I dig the antique gold. Between the Baubles is gorgeous! I love the base you users. It fits really nicely with the gold. Oh hush! This is beautiful! Simple and elegant. This is so cute! I love the polishes you used! That is one of the coolest Christmas plates I have seen! It's cute indeed! And hey, new lay-out? Looks great! Still a work in progress but yes! This is such a gorgeous look! I love it! 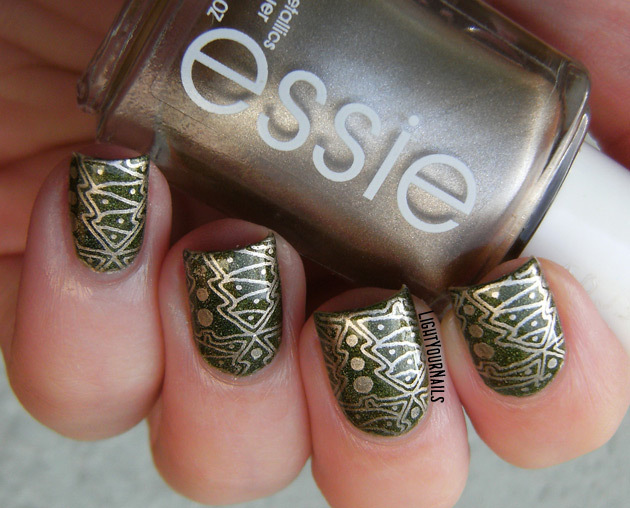 I love this mani!!! It has a Christmas tree/circuit board feel. Geeky and christmasy at the same time!!!! Thank you Nina! What a great perspective! Nail art semplice e carina! I really love the way it turned out! The trees are one of my favorite stamping image.